In a week's time you could be a fully qualified freefall skydiver! Imagine being able to skydive anywhere in the world any time you liked! - In a weeks' time all this could be yours as a fully qualified skydiver after completing one of our Accelerated Freefall (AFF) courses. AFF is the quickest way to become a freefall parachutist involving just eight jumps! What's more it is completely up to you how long the course takes - you can spread the jumps out over a number of weeks or even months or alternatively you can select one of our intensive courses and be fully qualified in just under a week - the choice is totally yours. The following information explains everything you need to know about the full AFF course. Parachuting is one of the most exhilarating experiences you will ever have and upon completion of one our AFF courses you will be able to experience skydiving as often as you like. 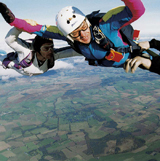 What does the accelerated free fall sky diving course involve? There are eight levels in the AFF course with each level aiming to teach you a new sky diving skill. Most people require only one jump on each level but occasionally if the instructors think that you have not fully mastered all the required techniques you may have to repeat the level again (at reduced cost). Before you go anywhere near the aircraft you will receive a thorough six hours ground training teaching you the basics of skydiving together with a thorough explanation of what you will be doing on your first jump. During the jump itself you will be accompanied by two instructors who will communicate with you in mid-air with hand signals and when you come to land you will be guided in by an instructor on the ground through a radio fitted in your helmet. On levels two and three you will receive yet more ground training as you begin to learn all the basic techniques of body flight. You will once again be accompanied by two instructors on each jump and will practise minor turns, altitude awareness and forward flight. Again you will land solo under the guidance of an instructor on the ground with a radio. Levels four to seven take you through the more advanced skydiving techniques as you learn spotting (directing the plane to the exit point), solo exits, loops and recovery from planned unstable body positions. On these levels you will be accompanied by one instructor landing under the direction of a ground instructor with a radio. By the final level you will exit, freefall and land solo whilst your instructor watches your technique. Upon passing this level you will be qualified to jump solo at any AFF approved centre across the UK but will not receive your Category 8 licence (allowing you to jump solo from any non-AFF centre across the UK) until you have completed 10 consolidation jumps. You do not have to be extremely talented in any way to be a skydiver - over 300 people take the course and qualify every year. When you have decided you want to take the up the opportunity of a lifetime give us a call or just book online for your chance to become a freefall skydiver! How do I reserve my place on the accelerated free fall course? Simply click here to book online at your choice of British Parachute Association approved centres, or request an information pack.